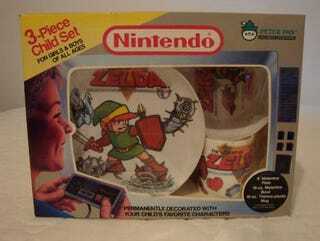 The starting bid is not yet met on this set of new-in-the-box Legend of Zelda dishware from 1989, a three-piece set the seller hopes to sell for $100,000 but will be willing to part with for, presumably, $15,000. "This is really a rare find and it is likely that there is no other such set even complete together in existence still today," says the seller. "It was made by Peter Pan and is officially licensed by Nintendo. I am going to put a donation on this auction too because if this is going to sell for what it should sell for, then I think part of that money should go to a charity." That charity is the American Red Cross, with 10 percent of the final bid going to the organization. The opening bid is $15,000. The set includes a plate, cup and bowl. Ball's in your court, Internet.